This fall, BMW is introducing a car for those who are unhappy with the growth of the 3-series sedan—six inches longer in the past two generations alone. It’s called the X1, and it’s about the same length as the 2003 3-series yet is more spacious, more useful, and more luxurious. Yes, the X designation suggests that it’s an SUV—or SAV for Sports Activity Vehicle in BMW vernacular—but it’s not really. For one thing, the X1 is only 60.8 inches high. That’s at least five inches shorter than most compact SUVs and no taller than the likes of a Ford Taurus or Suzuki SX4. 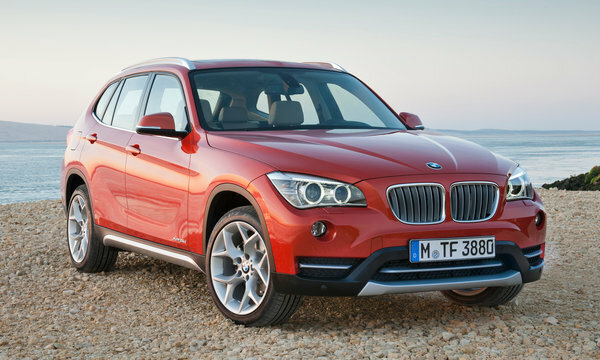 For another, the X1 is the first BMW X model available in a rear-wheel-drive version. From behind the wheel, this X1 drives like a nimble hatchback with a slightly higher seating position. The hardware has great DNA, as the X1 is derived from the 1-series model we have in America, which is closely related to the last-generation (E90) 3-series. That means a solid structure, first-rate suspension design, and excellent powertrains. The X1 comes as the rear-drive sDrive28i or all-wheel-drive xDrive28i, with BMW’s 2.0-liter turbo four with 240 hp, or as the xDrive35i, with the 300-hp turbo 3.0-liter six (North America is the only market where the X1 gets this bigger engine). Unfortunately, no manual transmission is available, and you can't pair rear-wheel drive with the six-cylinder. But the four’s automatic is the superb eight-speed ZF unit that we have universally praised in its other BMW applications; the xDrive35i offers only a six-speed automatic transmission. The X1 was introduced in Germany a couple years ago (we drove one then), and we’re getting a face-lifted version that is very likable. The interior is richer than the one we get in U.S. 1-series cars—it’s at least as nice as that of the last-generation 3-series. The materials are high quality, the textures and colors are tasteful, and everything is assembled flawlessly. The premium sense is reinforced by a structure that felt rock solid on the Bavarian roads near BMW headquarters in Munich, and the cabin was hushed even at 100 mph. 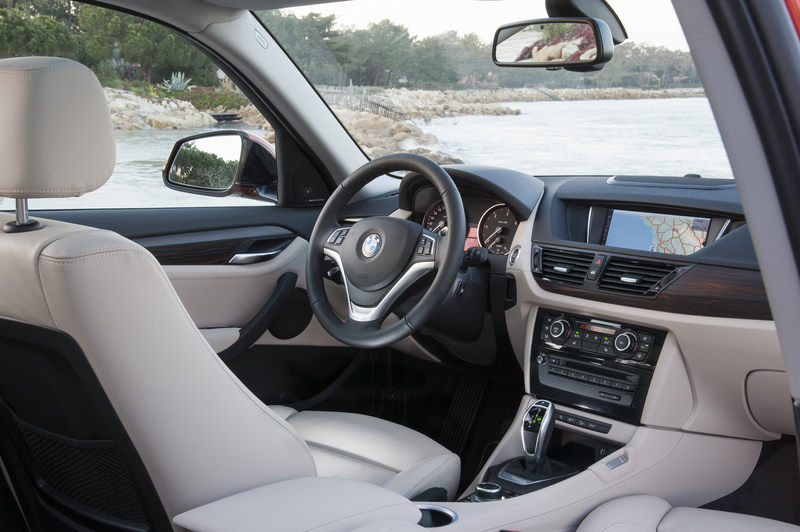 Although you sit a couple inches higher in the X1 than in a BMW sedan, the driving position still feels more carlike than trucklike. Brake feel is superb, and the steering precision and weighting are very good, even on the rear-drive model that uses an electrically assisted rack. Moreover, the 2.0-liter turbo and eight-speed-automatic combo motivates the X1 effortlessly. Both four-cylinder models should require a bit more than six seconds to reach 60, and BMW is estimating about 24 mpg on the EPA city cycle and 33 on the highway with the four-cylinder and rear-wheel drive. At the other end of the economy spectrum, the xDrive35i is projected to achieve ratings of 18/27 mpg. At 6.5 inches shorter, 3.3 inches narrower, and 4.6 inches lower than an X3, the X1 gives up some space. But the front compartment has generous leg- and headroom and plenty of shoulder room for all but outlying adults. The rear seat offers plenty of shoulder and headroom for two adults, but kneeroom is on the tight side, recalling that 2003 3-series. And the combination of the narrow cabin and large driveline tunnel makes the middle position fairly useless. Behind the back seat, you have 25.0 cubic feet of cargo space, nearly 50 percent more than what you get in a current 3-series trunk. And the rear seat folds in sections to progressively increase storage to 56.0 cubic feet. That’s not quite as much as a Honda CR-V can hold, but then the X1 is shorter, narrower, and much lower. Perhaps the best way to view the X1 is as a 1-series five-door hatchback, reconstituted in a shape designed to appeal to Americans. This is obvious pandering, but at least this faux SUV is well packaged, relatively efficient, and good to drive. In fact, it drives much like a BMW car. With base prices ranging from $31,545 for an sDrive28i to $39,345 for an xDrive35i, the X1 likely will find plenty of takers.